Your time is valuable and we understand that. This is why you can depend on us for complete project management – everything from financing to support, as well as design and product supply. Your LED lighting financing covers everything from initial LED lighting products, recycling of your previous lighting, to design and installation – 100% project financing. LED Lighting Financing with L.O.T. allows for your funds to be available when you need it. Enjoy the financial flexibility. If you have any questions or want to see the best way to get your lighting project on it's way contact a Project Manager today! 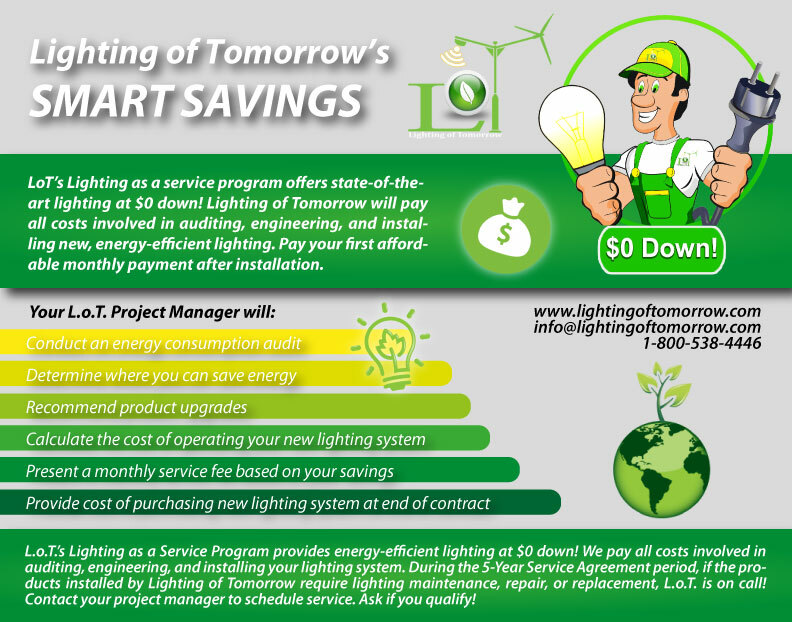 With our Smart Savings Program you can start saving energy and money with a $0 dollar upfront cost. LED lighting can save up to 80% of your current electricty use. We take our subscription charge out of your savings. With L.o.T. you can get a lighting upgrade and save money with no cost to you! You can beome cash flow positive from day 1 and treat our subsubscription charge as an operating expense. Save time, money, energy, and your bottom line with L.o.T. If you have any questions or want to see if your project qualifies contact a Project Manger today!